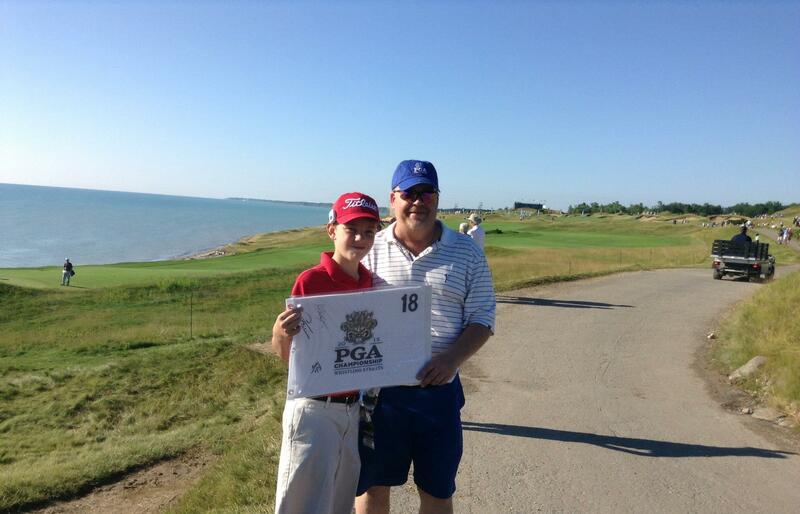 Wisconsin Pyramids Discovered by Michigan Father and Son while visiting PGA Championship in 2015 in Wisconsin. 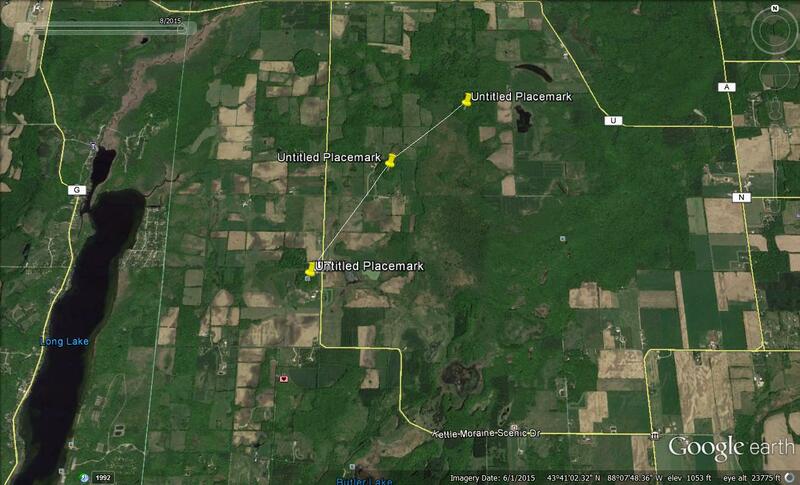 Pyramid Structures in Wisconsin match Giza Pyramids in relation to north poles verifiable on Google Earth! While vacationing in Wisconsin in 2015 with my son at the PGA Championship at Whistling Straits we came across an amazing discovery quite by accident just by being observant. It was a chance for me to spend some quality time with my son. He is quite a good little golfer in fact was 5 hole champion of Flint Junior Golf. It was a great opportunity for us to get away to Wisconsin and I always knew that experiencing a major tournament with him would always be something he would never forget, me either! The PGA Championship was awesome he received many autographs including Phil Mickelson and many others. We watched Jason Day set the all time lowest score ever in a major, camped all week in Dundee Wi at the Long Lake Recreation Area for the entire week of August 10th through the 16th of August, 2015, magic filled the air! That alone was and is enough for what I was hoping for by taking him on that vacation, but that's where this story takes a mystical other worldly twist which may excite some archaeologists and fans of the Ancient Aliens series - Ancient Astronaut Theorists! We arrived at the campground in Dundee on late Monday afternoon. We had all week passes and Monday and Tuesday were practice rounds so we deciced to just get to the campground and get the site set up and start out fresh in the morning. We drove from about 6am from Michigan to get there around 4pm in the afternoon. We set up the site did some swimming and played frisbee, built a campfire and talked about how excited we were to be going to the PGA Championship and watching Phil Mickelson, Jordan Spieth and all the others! The very next morning it was bright sunshine and we were on our way to the course we headed north on Division Rd. 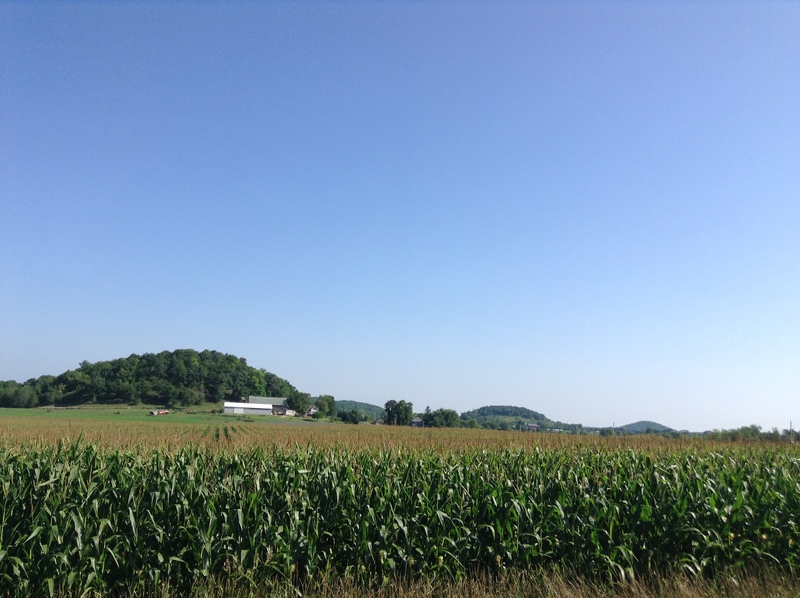 and took a right on Deer Rd., it wasn't more than a minute later in the morning light that I looked to my left (North) and noticed 3 distinctive mounds which resembled the pyramids at Giza and I immediatly said to my son, "Hey Look It's the Pyramids at Egypt." He replied, "Yes, it does look like it!". That image stayed with me but we continued on to the course. Later that night when we returned to the campground and sat at the campfire talking about all the autographs we received that day, listened to Steve Miller's greatest hits and I mentioned, "Tomorrow on the way to the course I want to take a picture of those pyramids", that was too weird. I realized the things I heard about the area and knew of the glaciers that had shaped the area but those seemed wierdly out of place and having more intellegent design that the other hills I saw that week. We woke the next morning and headed to the course, once we turned on Deer Rd. I stopped the car we had a perfect clear day again and I snapped off this photgraph with my IPhone. After we returned home after and amazing week and amazing tournament, I couldn't get the pyramid mounds out of my head and so I got the idea to go to Google Earth and do some research of my own on the area and take a look at these mounds from a overhead view and see if there was anything to it, my initial gut instinct was it seemed like there was something. The first thing I decided to do was to do an overhead view on Google earth and plot the points of the mounds with the yellow location markers and do a screen shot and take a pic of that. Here is that image. 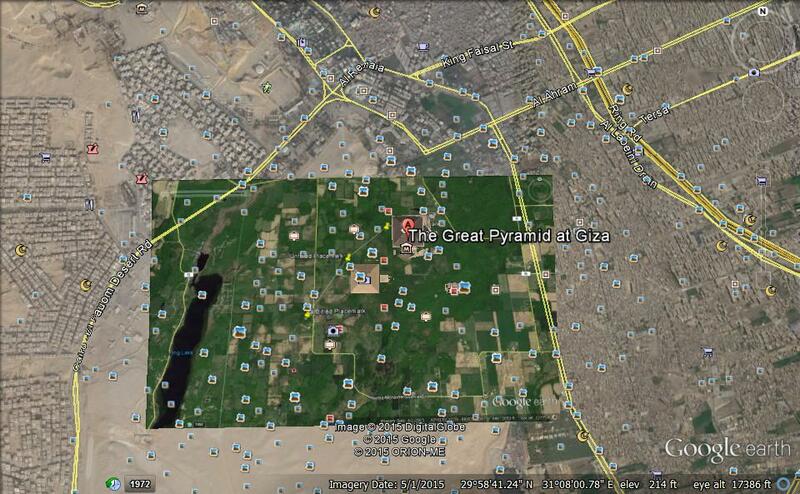 Having studied Egypt as a general interest I could see the alignment similarity in this image and so I did the logical next step and decided to compare this image with the alignment of the pyramids at Giza. I brought up the Giza Plateu on Google Earth and Took a screen shot of that image and decided to layer the Wisconsin Mounds over the Giza Pyramids and see if there was any similarity. Here is that Image. At this point the hair on my arms started to stand up! As you can clearly see the pinpoint alignments from Wisconsin exactly match the location of the Pyramids at Giza by comparing the yellow location markers with Wisconsin to the Pyramids at Giza. They are exactly the same and I figured the odds of that had to be 1 in a million but still decided to keep looking for more clues in support of what seemed to be very impressive. The next thing I decided to do was look closer at the mounds in Wisconsin for any type of structure to the mounds that would appear to be man made or something of that nature. So I decided to zoom in on the first mound (The southernmost one of the 3) and take a look on Google Earth. I knew by visiting the site it was going to be tough as the mound was tree covered and I wasn't sure I would be able to see anything but decided to have a look and here is that image. As I zoomed in on Google Earth I was pleasantly surprised to see hill striations of equal distance through the trees that appear to be man made. I can't see anything in nature that would have this striation pattern evenly distributed without man having something to do with it. Let just say at this point I decided to share this information with Scott Wolter of the American Unearthed Series. He said the area was filled with glacial activity which would require boots on the ground for research. Being busy the last couple years I never have taken the trip back there, but feel strongly that there is more to this alignment and the exact match to Giza which seemed beyond reason that some random act of nature would create this! My inclination is not to draw any conclusion although my gut instinct says there is definately more to this and needs further research and checking. The date today February 4th, 2019, I have shared this information with Ramy Romany and famous Egyptologist via Facebook and hope he looks into it. It really made our great Father and Son getaway have a timeless quality that I will alway appreciate. I encourage all people, researchers, geologists, archaeologists, ancient astronaut theorists to check into it. I have taken a few more photographs tonight off Google Earth in support of this mission. Here are those photos! 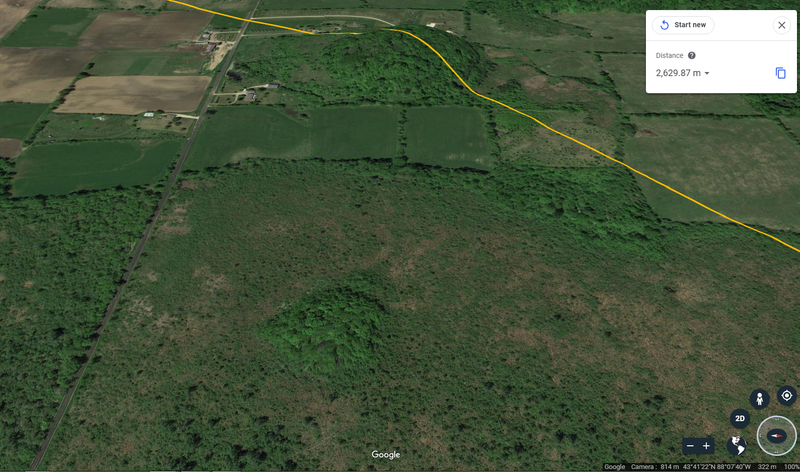 Here is a Google Earth Overhead alignment of the Wisconsin Mounds from a East View. If you notice the middle pyramid mound and look just to the east of it there also appears to be a elevation approxamately in the same location as the Sphinx at Egypt. 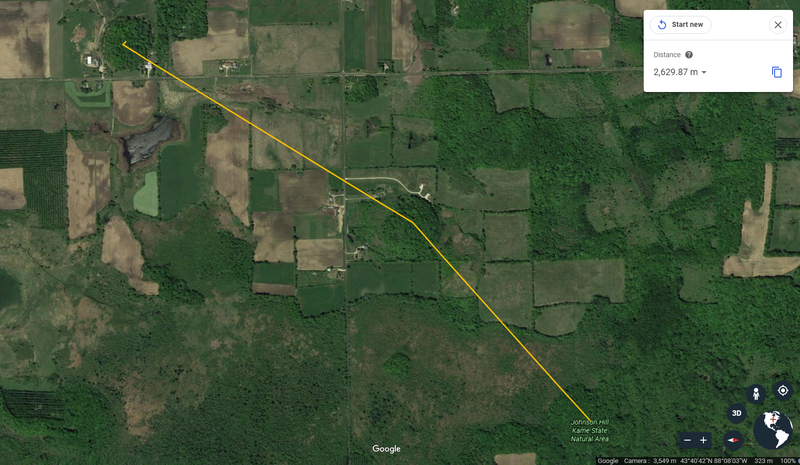 I decided to do a 3D Google Earth Image of the noted elevation and here is that image. Thanks for taking the time to read my story and I look forward to more people looking into this. I try to jump to no conclusions but certianly find the verification of this exact alignment with Giza to be of great interest and something that needs to be researched further. My gut instinct says there is more to it and I look forward to hearing a professional view on the structures, the similartiy and exact alignment. Who knows it could end up being the next Gobleki Tepi! If you would like to contact me about the story feel free to send me an email at seoconsultingpros@gmail.com . Appreciate your time and thanks for checking it out! We would like to thank the awesome people of Wisconsin for treating us so great on our visit, specifically, Whistling Straits, Blackwolf Run Golf Course, Champs Sports Bar, Sunset Hills Golf Course, The Hamburger Haus in Campbellsport, Long Lake Recreation Area! Thank You! Like our Page Wisconsin Pyramids and Other Discoveries On Facebook! Share Your Story!